Popular with visitors since June 6th 1944, Sainte Mere Eglise has an excellent museum and plenty of shops for the military collector. 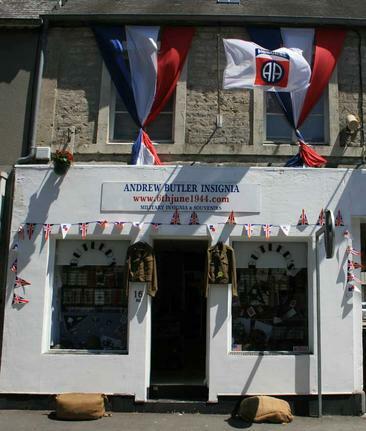 Andrew Butler's "6th June" insignia and militaria shop is a popular attraction. You will find his shop at 16bis Rue General de Gaulle - just around the corner from the C47 Cafe and the square. The C47 Cafe is a regular haunt for visitors and your host Ellwood's highly acclaimed documentary "The Americans on D-Day " is a must have DVD for all enthusiasts. By Tuesday lunchtime the re-enactors are arriving and military vehicles are already convoying in large numbers. We will be back to Sainte Mere Eglise throughout the week as the commemoration events unfold. Thanks to Hannah Butler for these pictures.